The ancient sages counsel that love for God dawns easily through bhakti (devotion) and therefore devotions should be offered to God even at the cost of millions of other works. 'Even the occasional remembrance of God in the smallest way acquires the power to destroy 'heinous sins'. 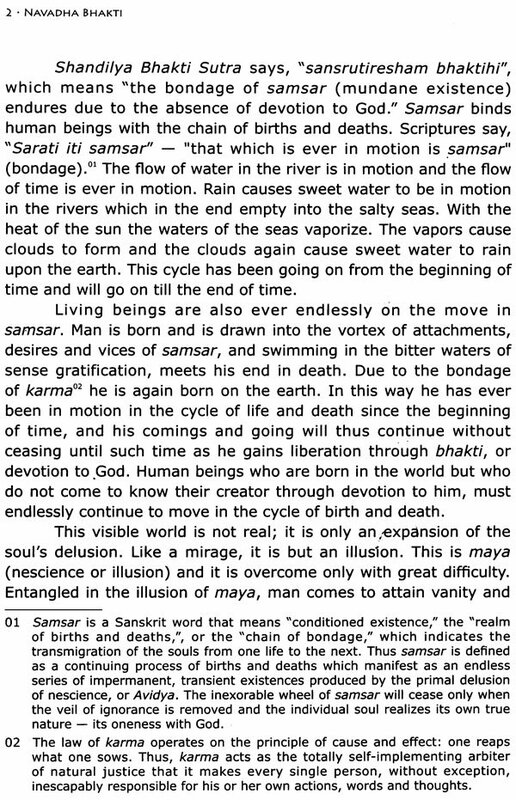 (Shandilya Bhakti Sutra, 2:2:21). The great devotee Narsinh Mehta extolled the significance of bhakti when he said: "Bhakti is a great matter upon the earth; it does not exist in Brahma's heaven." Indian Scriptures say that one's human ancestors continue to undergo endless cycles of births and deaths in this world with a desire to obtain a human body, because not only does the bhakti yogi himself swim across the ocean of worldly existence, but he also carries across with him many ancestors. Therefore every human being should become indifferent to all worldly desires and practice bhakti. In this alone lies the success of human life. Yoga and bhakti both lead to union with God. 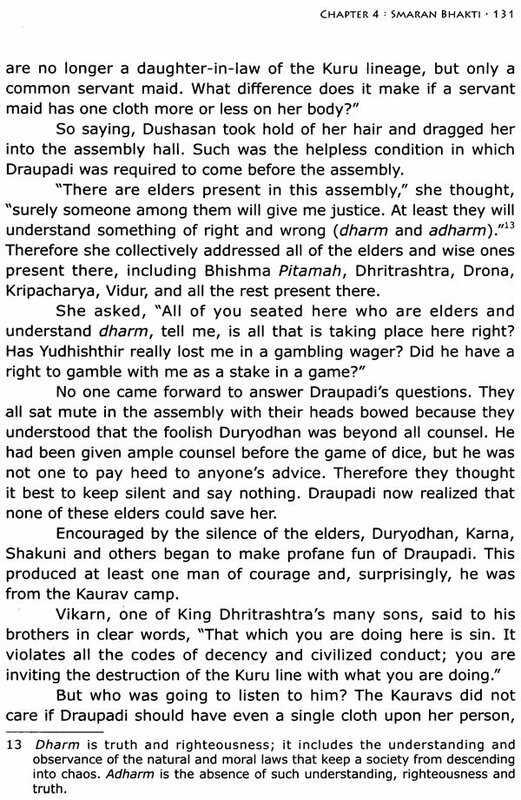 Sage Vyas has described nine types of Bhakti in the Srimad Bhagavat. This excellent volume by a modem day Sage explains this navadha bhakti extolled by the Indian Scriptures. Swami Rajarshi Muni was born on 11th February, 1931, in a lineage of warrior kings. He received sannyas initiation in February 1971 and thereafter devoted himself almost exclusively to secluded yoga sadhana, his daily practice spanning at least ten hours. He is an advanced yogi, a realized Master in the classic mould of Indian adepts, knower of the kundalini and master of the khechari mudra. The extraordinary heights he has attained in his yoga practice establish him firmly as the latest addition to the lineage of siddhs (adepts) which has long embellished the Indian spiritual tradition. The ancient sages counsel that love for God dawns easily through bhakti (devotion) and therefore devotions should be offered to God even at the cost of millions of other works. In the Shandilya Bhakti Sutra it is said, "Even the occasional remembrance of God in the smallest way acquires the power to destroy heinous sins". The great devotee Narsinh Mehta extolled the significance of bhakti when he said: "Bhakti is a great matter upon the earth; it does not exist in Brahma's heaven." This indicates that a human birth should not be wasted; for only a human being born upon the earth has the invaluable opportunity to practice bhakti yoga. 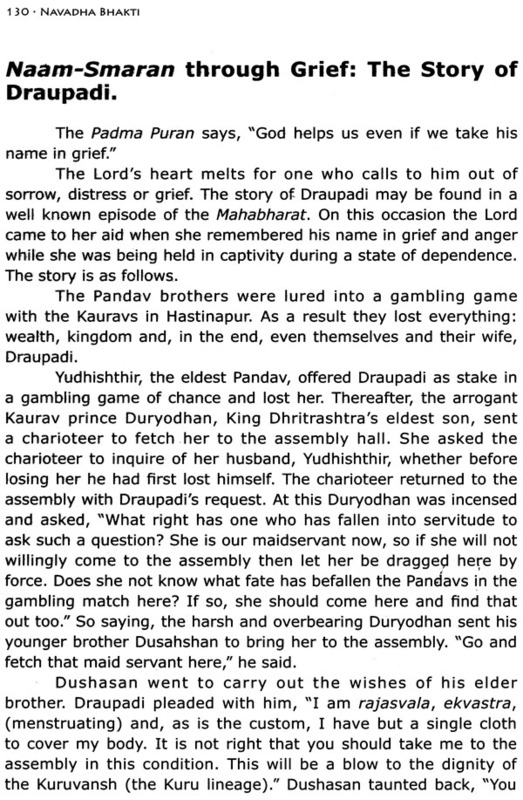 In this regard Lord Krishna himself says to Arjun in the Bagavad Gita (9:33): "Oh Arjun, by Divine Will you have taken birth in this impermanent and painful realm of death. Offer devotions to me, for the best of ends are attained through recourse to my protection". It is also said in the Indian Scriptures that one's human ancestors continue to undergo endless cycles of births and deaths in this world with a desire to obtain a human body, because not only does the bhakti yogi himself swim across the ocean of worldly existence, but he also carries across with him many ancestors. Therefore every human being should become indifferent to all worldly desires and practice bhakti. In this alone lies the success of human life. Bear in mind that Yoga and bhakti both lead to union with God and therefore are not different. 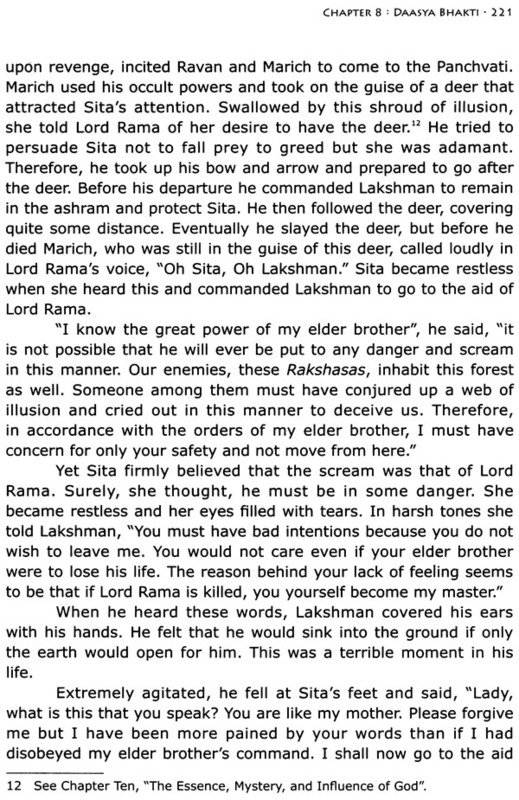 Even Lord Krishna describes bhakti in the Gita as Bhakti Yoga. Sage Narad has described eleven types of bhakti which are by and large quite similar to the nine types described by Sage Vyas in the Srimad Bhagavat. In this book we will consider and understand in detail this navadha bhakti, the nine ways of devotion to God. This book is a translation of my orginal book Navadha Bhakti in Gujarati (Life Mission Publications, 2004). The translation has been done by Kr. Fateh Singh Jasol and edited by Robert Lamont, who has also added copious and well researched footnotes for the benefit of readers. I bless them both for their service.